Strip brushes are usually designed with bristles that are attached to a U-shaped metal channel and a center wire. They can also be flexible strip brushes and use a bendable brush back instead of a metal channel. They can be used for chip removal, sealing, surface cleaning, conveyor cleaning, and virtually any other application. They can also be used for deburring, cleaning, scrubbing, dusting, spreading liquids and powders, polishing, and static dissipation. Strip brushes are versatile brushes that can be customized to meet any of your applications. They can be formed into a variety of shapes including: straight, closed and open wound coil, disc, cup, triangular, oval, and helical. Industrial strip brushes can be created with galvanized or stainless-steel metal channels and high-quality filling materials. For further customization, a wide variety of filament trim lengths and diameters are also available. Gordon Brush manufactures a variety of strip brushes, and we can work with you to customize the strip brushes that meet your application requirements. The type of strip brush that is used depends heavily on the intended use. Flexible strip brushes offer bendable backing and filaments, making it useful for different purposes than traditional metal channel strip brushes. They are useful when there is more than a one directional curve desired in a brush, like holding paper in a printing press or sealing odd shaped openings in machinery. 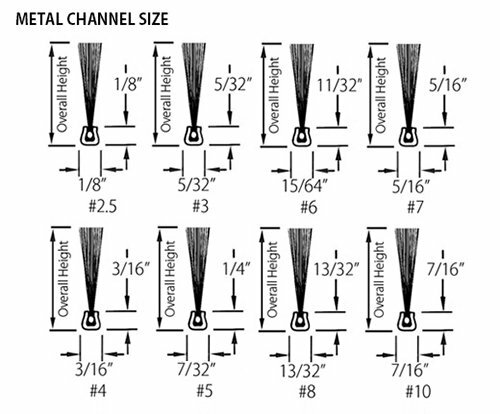 There are many choices of brush fillings and virtually an infinite number of brush specifications within each metal channel size. For this reason, we ask that you complete the Strip Brush Design Form. The completed sheet will let us know what your individual requirements are so that we can make a brush to fit your needs. This includes the proper bristle material, and allows for the length, trim and overall design to fit your application. Brass: Brushes with brass wire can be used as a brush seal on a piece of equipment. They can protect machinery and other parts from mist, dust, light, heat, or intrusion. Strip brushes can also hold down products, reduce static, detect holes in insulation coatings, apply wet or dry coatings, or dust away loose particles. Nylon: Brushes with nylon wire can also be used as a brush seal, and the conductive nylon makes a great static reduction strip brush. Many types of Nylon are also FDA approved and can be used for direct food-contact applications, as well as moisture or high humidity applications. Stainless Steel: In addition to acting as a brush seal, strip brushes with stainless steel wire can be mounted on a conveyor line to redirect or stabilize a moving product. They can also be used for continuous operating temperatures up to 600 degrees Fahrenheit. Polypropylene: Brushes designed with polypropylene filaments offer good chemical resistance to acids, corrosive alkalis, and many other solvents. They are best suited for low temperature applications, as they being to soften at 225 degrees Fahrenheit. Tampico: These brushes provide good heat resistance for temperature up to 400 degrees Fahrenheit. This material is primarily used either wet or dry for scrubbing, washing, polishing, and dusting. It can also be used as a product hold-down, an applicator of wet or dry coatings, or as a static or driven scrub brush to remove loose material. 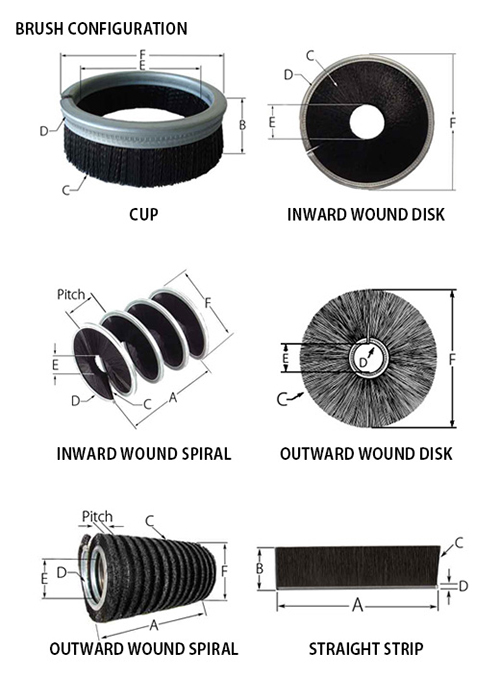 The size of the strip brush is determined by channel size (the metal back), and the fill material and brush configuration (such as straight, coiled, wound or cup-like). Trim lengths are virtually unlimited; channel sizes range by number. The smaller the number, the smaller the base width. Bristle material depends on what your application requires. Almost all bristle material is available, including both conductive and static dissipative materials, in a range of diameter sizes. Gordon Brush offers more industrial and specialty brushes than any other brush manufacturer. In addition to our large stock of standard strip brushes, we can customize our brushes to meet any of your applications needs. We offer customizable options for size, shape, filament material, channel material, and more. For any other specific strip brushes you may need, further scan this web site or call us at 1-800-950-7950 or 1-323-724-7777. If you know you need a custom strip brush, complete the Strip Brush Custom Design Form. Gordon Brush will get back to you within 24 hours with a quotation.